Woo hoo~ Friends from North America and Western Europe... Be sure to look high up in the sky this weekend... Because the LEONID METEOR SHOWER is going to give you guys' sky a really good and nice bath! Saturday 18 Nov : 11:45p.m. 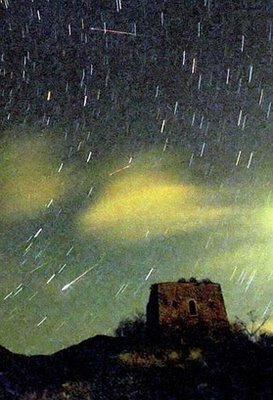 Precise prediction of meteor showers is an infant science, so those in position to observe the possible outburst should plan to head out a half-hour before the predicted peak, allowing eyes time to adjust to the dark, and stay out for up to a half hour after the expected peak. No special equipment is needed. Telescopes and binoculars are of no use. A lounge chair or blanket and warm clothes are all you need. Find a dark location with a clear view of the Eastern horizon. Lie back, face East, and scan as much of the sky as you can . You never know exactly where a Leonid will appear.